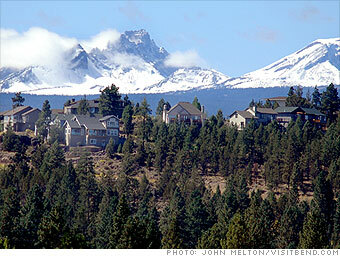 Discover Bend, Oregon; an inviting high desert, mountain getaway. Tucked away between the Cascade Mountains and the high desert plateaus, is the friendly town of Bend Oregon. Get ready for warm sunny days and calm cool nights. Travel in one of Desert Jet’s private air charter flights to Bend Municipal Airport (ICAO: KBDN, FAA: BDN). Other nearby airports include Redmond Municipal Airport (IATA: RDM, ICAO: KRDM) and Sunriver Airport (IATA: SUO, ICAO: KS21). If you are flying in from the south and watch closely, you may be rewarded with a spectacular view of Crater Lake. What will your next adventure be? Enjoy the summer activities at Mt. Bachelor’s outdoor playground which include cycling, hiking, fly-fishing, and disc golf. As you climb the mountain by foot, plan to have lunch at the Pine Martin Lodge. Enjoy the panoramic views while dining on the fresh salads and gourmet pizza that are served daily. During the winter be sure to enjoy the downhill skiing and snowboarding, as well as snowshoeing, sledding, horse-drawn sleigh rides, and dog sledding. As you can see, there is plenty of fun to be had. Looking for a Brewery? You’re in the right place. Bend is famous for the Bend Ale trail, a walkable and bike able trail that houses nine world class breweries. Both locals and visitors alike will enjoy learning about the new state of the art brewing techniques and tasting the incredibly delicious craft beer. Be sure to pick up your passports. Collect all 9 stamps to win a special prize. Hint, Hint: It is beer related. Bend, Oregon has something to offer for everyone, so be sure to add it to your list of future destinations. When you are ready to book your next charter flight, please contact us at 760-399-1000 or charter@desertjet.com, where a charter specialist will be glad to arrange your travel accommodations. Let Desert Jet take you there.